It's that time of the year when field work is next to impossible and in any case not warranted due to current and likely weather conditions over the next two months. It does provide an ideal opportunity to spend some quality time with family members and for those of us who must be doing something all the time, we can review the year just finished and plan ahead for 2018. Price prospects for 2018 do not look too exciting and serious decisions should be made if losses are to be minimised. The opportunity to make any reasonable return, particularly from expensive rented or poor land, is unlikely. The first assessment should be to identify the rented land being used and determine if this is a good proposition. Using yields and prices achieved this autumn, coupled with costs incurred during the season, mean it is a relatively easy and quick exercise to determine which fields and which crops have left a viable margin. Obviously straw and straw prices contributed significantly to tillage returns in 2017 and this is likely to be the case again in 2018. Nevertheless, returns have been poor for many tillage operators and it may be a better option for some land to consider either, a suitable break crop, returning it to grass or leaving it fallow. We have seen from recent Teagasc reports that dairy is performing well again and, more luck to all dairy farmers. However, they generally like to hold onto their earnings and are slow to part with extra money, particularly for straw. It is also a fact that most tillage farmers do not like to abuse their position as straw sellers. In many cases they continue to charge similar prices annually despite the significant price increase that is warranted this year. There is no doubt the genuine acceptance that long term and quality clients must be "looked after" in years of high prices. However, when overall returns are dependent on good straw returns nobody, especially dairy farmers, will thank growers for suffering viability issues which may eventually drive them out of cereal production. Ultimately if growers cannot survive and make a decent living out of the grain harvest, then any extra straw income must be capitalised upon. Straw will continue to be a vital raw material for the dairy enterprise. 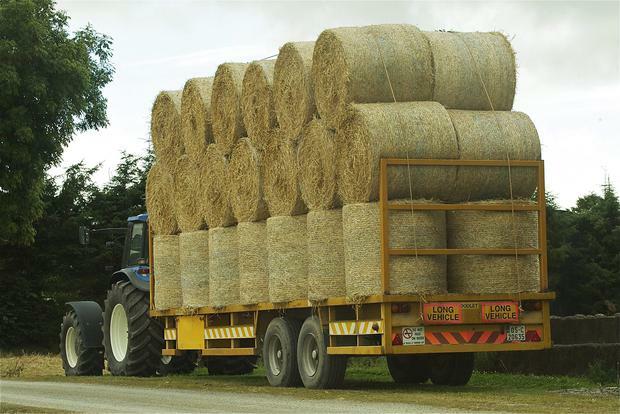 Already this year there are reports of rising imports of straw and significantly higher prices than that which are available locally. Machinery This is also a good time of the year to look at machinery costs and consider how machinery costs can be reduced. Options include: What machines can be done without? Is it possible to share certain machinery between a number of like-minded neighbours? Is a machinery ring between a few farmers worth considering? If new machinery is required can this be shared or what level of grants are available? Is it worthwhile hiring a machine eg extra tractor at busy times of the year or is it a cheaper option to consider a contractor for certain operations? While currently it is difficult to justify new investments in machinery, the tillage TAMS grants are relatively attractive. In many cases, this will allow upgrading of certain machines particularly sprayers or fertiliser spreaders which may be close to or at the end of their useful life. Either a 40 or 60 percent grant is available depending on whether a young farmer is applying. At a minimum, now is the time of the year to undertake all your equipment repairs and maintenance to be ready for the spring, which, I predict could be early. A number of farmers failed to get any winter cereals sown this autumn and will therefore have to consider what three crops they might plant next spring. There are many options available but thinking about your likely market and a crops' potential for making money/not losing money should be foremost when decisions are being made. Continue to monitor crops for pests such as slugs. With the current cold weather, it is unlikely that aphids will be a problem. However, should weather conditions turn milder aphids may still cause damage and depending on when the last aphicide was applied consideration might be given to what to do if this happens. Over the last number of weeks I have been heavily involved in GLAS and KT meetings. Invariably the issue of Health and Safety arises and no meeting has been held where some participant did not demonstrate or articulate a health and safety issue they themselves had experienced recently on farm. These incidents may not have been too serious, but do highlight the necessity for all farmers to safety proof their farm and particularly to slow down and stop rushing. It is a dangerous time of the year with the long evenings and the poor weather. Taking care and having an up to date risk assessment carried out could determine the level of stress or injury that might otherwise blight a carefree Christmas. Finally, it just remains for me to wish each and every one of our readers a very happy and joyous Christmas and a successful and safe 2018.